Win the Snowboard Boss 1 Challenge. Win the Downhill Boss 1 Challenge. Win the Biathlon Boss 1 Challenge. Win the Biathlon Jet 1 Challenge. Win the Freeride Jet 1 Challenge. Win the Freeride Boss 1 Challenge. Win the Biathlon Gold Rush 2 Challenge. Win the Bobsled Boss 1 Challenge. Win the Snowboard Gold Rush 2 Challenge. Win the Freeride Gold Rush 1 Challenge. Win the Bobsled Boss 2 Challenge. Win the Downhill Jet 1 Challenge. Win the Biathlon Bone Breaker 2 Challenge. Win the Bobsled Jet 1 Challenge. 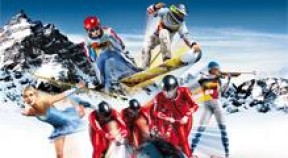 Win the Bobsled Gold Rush 2 Challenge. Win the Snowboard Trickser 2 Challenge. Win the Downhill Boss 2 Challenge. Win the Snowboard Jet 2 Challenge. Win the Snowboard Bone Breaker 2 Challenge. Win the Downhill Jet 2 Challenge. Win the Biathlon Boss 2 Challenge. Win the Freeride Gold Rush 2 Challenge. Win the Freeride Trickser 2 Challenge. Win the Freeride Boss 2 Challenge. Win the Freeride Bone Breaker 2 Challenge. Win the Bobsled Bone Breaker 2 Challenge. Win the Bobsled Jet 2 Challenge. Win the Downhill Bone Breaker 2 Challenge. Win the Snowboard Bone Breaker 1 Challenge. Win the Freeride Jet 2 Challenge. Win the Snowboard Boss 2 Challenge. Triumph at the Rookie Cup. Win the Sophomores Best Cup. Triumph at the Ski or Die Cup. Win the First Big Time Cup. Triumph at the Night Move Cup. Triumph at the Race Cup. Win the Lord Ice Cup. Triumph at the Five To Stay Alive Cup. Win the Night of Five Cup. Triumph at the Fab 4 Cup. Triumph at the Oldschool Cup. Triumph at the Go for Gold Cup.